Partnerships for Student Employment...we get you networking from the very beginning! In partnership with Southern Interior Flight Centre, Strategic Aviation Services Ltd is providing job opportunities for people who have a passion for the aviation industry. 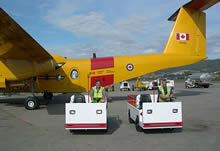 We are in the business of providing our customers with the ultimate in Ground Support Services. Who better to involve than aspiring pilots who can enrich their knowledge of the industry and benefit from an in depth perspective. We are a business built upon Safety, Integrity and an overall positive approach to excellence in the services we provide. We are looking for ambitious, energetic individuals to join our team who can uphold the culture of our company and who are interested in all aspects of aviation. Our schedules are flexible and our Management is highly motivated in every task they undertake. Have fun and fly safe! Ironman Holdings Ltd dba Kelowna Ramp Services is pleased to offer employment opportunities to the students of Southern Interior Flight Centre. 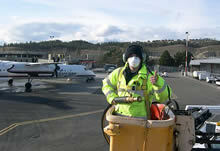 Ironman Holdings Ltd. has been providing airline ground handling services at the Kelowna International Airport since 1985. We are a team of professional individuals who have worked to build and maintain a company that provides top service excellence within the airline industry. Since the early 1990’s we have worked with Southern Interior Flight Centre to provide flexible part-time employment opportunities for their students. Many of our past employees & alumni of Southern Interior Flight Centre have moved on to fulfill exciting airline careers working as Pilots, Managers and Pilot Instructors for airlines around the world including Air Canada, British Airways, WestJet and Central Mountain Air. We are looking for hard working, enthusiastic, safety minded individuals who are interested in expanding their experience within the airline industry. We Help You Become Employed Even During Your Training! !